The first AC/DC news of 2014 was the result of Bruce Springsteen performing the band’s 1979 classic, “Highway To Hell”, in Perth on February 8 as part of his Australian tour – he’d be joined by Pearl Jam’s Eddie Vedder for the tune in Brisbane on February 26. That same month, singer Brian Johnson revealed major news regarding plans for the band’s first new album since 2008’s “Black Ice” and a 40th anniversary tour. Drummer Phil Rudd was cleared in a helicopter licensing dispute by a New Zealand court in early March; it was not the only time Rudd would appear before a judge in 2014. Rumors about a possible AC/DC retirement announcement surfaced in April with a report out of Australia that guitarist and founding member Malcolm Young had recently suffered a stroke that left a blood clot on his brain. In May, Johnson launched a 6-episode UK TV series, “Cars That Rock”, focusing on his passion for cars and auto racing in general; the same month, the singer would drive in Mille Miglia 2014, a vintage car race in Italy. As AC/DC prepared to record new music in Vancouver with producer Brendan O’Brien, news surfaced that Malcolm and Angus Young’s nephew, Stevie, had stepped in to handle rhythm guitar for his absent Uncle. In July, Johnson confirmed the album was done, and on July 9, the singer received an Honorary Doctor of Music degree from Northumbria University in Newcastle upon Tyne. Rudd announced plans to release his debut solo album in August; the following month, AC/DC announced “Rock Or Bust” would be issued in December. The project’s lead single, “Play Ball”, was previewed in late September as part of a Major League Baseball Postseason campaign; the song officially premiered on October 7. 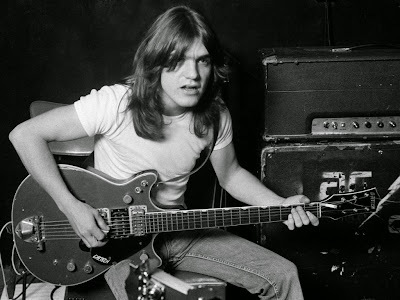 In late September, Malcolm’s family confirmed reports that the guitarist had been diagnosed with dementia while asking that their privacy be respected as the band’s founder was in full-time care for the health issue. Headlines that AC/DC used a fill-in drummer for a London video shoot in early October raised red flags that things weren’t right in the band’s camp, as did the release of a new group photo with Rudd noticeably absent from the picture. Then – on November 6 – the situation became clearer when Rudd was arrested and charged with attempting to procure a murder by New Zealand police after he allegedly tried to have two men killed. The murder plot charge was dropped the next day for lack of evidence, with Rudd entering not guilty pleas on three remaining charges on December 2. The drummer made more headlines a day later when he was handcuffed by New Zealand police after an altercation at a coffee shop; it was later determined that Rudd’s accidental run-in with a witness in his outstanding case was deemed a breach of his bail conditions and they were tightened further by the court. Full details regarding Rudd’s November 6 arrest were made public by police in December after applications from the media to view the court records were filed. In early December, “Rock Or Bust” debuted at No. 1 in Australia and No. 3 in the US. The band announced their first live dates for 2015 included a European tour, while Rudd’s status with group remains in question. At year’s end, rumors surfaced that AC/DC will perform at the 2015 Grammy Awards in Los Angles in February, as Johnson reteamed with Billy Joel on New Year’s Eve in Orlando. On January 6, it was announced that AC/DC will headline California’s Coachella festival in April.